Making a dramatic statement with its modern bridge-like design, the Sabre Island Light for Platinum by Quoizel is expertly stylish. 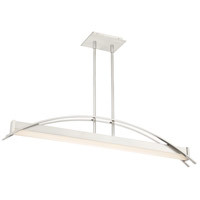 Two flat arcing beams span the length of the fixture and add depth to the rectangular shape of the body. The integrated LED light source is housed underneath a white acrylic shade. The brushed nickel finish is continued on the rods and canopy culminating in a completed work of art.